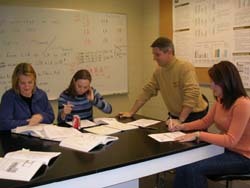 Many, many students have made contributions toward the research program in my laboratory. My research program depends on the students' diligent work and to all of my student researchers, I express my sincere thanks on jobs well done! During the January 2017 Interim term, Liz Hamel, Taylor Owen & Ally Drobonick investigated the role of the amygdala projections to the PBN in regulating feeding behavior. From left to right: Ally Drobonick, Hannah King, Cody Mesta & Callie Richards worked in the lab in the Fall of 2016 examining the taste palatability of antiretroviral HIV medications with a brief-access testing model in rats. 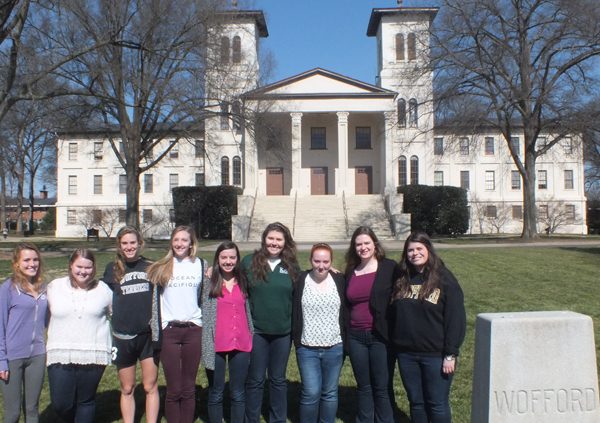 From left to right, top then bottom: Vanessa Zarubin ('18), Shelby Stewart ('18), Alex Thele ('18), Gabby Boniface ('18), Mary Elizabeth Bruner ('19), Liz Hamel ('18), Kassie Franck ('18), Anna Maria Hidalgo ('16), Amber Parnell ('18), Rachel Fenner ('18) & Nicole Schmidt ('18) conducted research during the Spring 2016 term in the Pittman laboratory investigating the role of central amygdala and lateral hypothalamic projections to the PBN on licking responses to tastants during long-term test sessions. 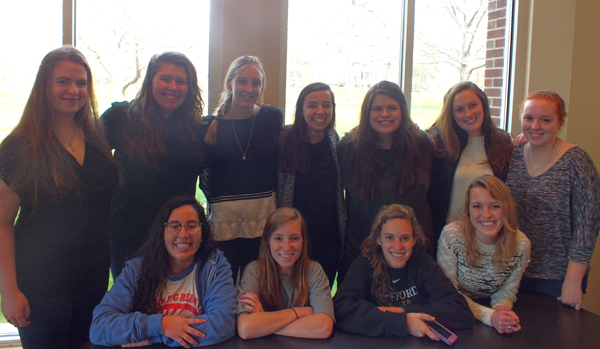 From left to right: Nicole Schmidt ('18), Olivia Crotts ('17), Rachel Fenner ('18), Alex Thele ('18), Gabby Boniface ('18), Shelby Stewart ('18), Kassie Franck ('18), Vanessa Zarubin ('18), & Mary Elizabeth Bruner ('19) conducted research during the Interim January 2016 term in the Pittman laboratory investigating the role of central amygdala and lateral hypothalamic projections to the PBN on licking responses to tastants during long-term test sessions. 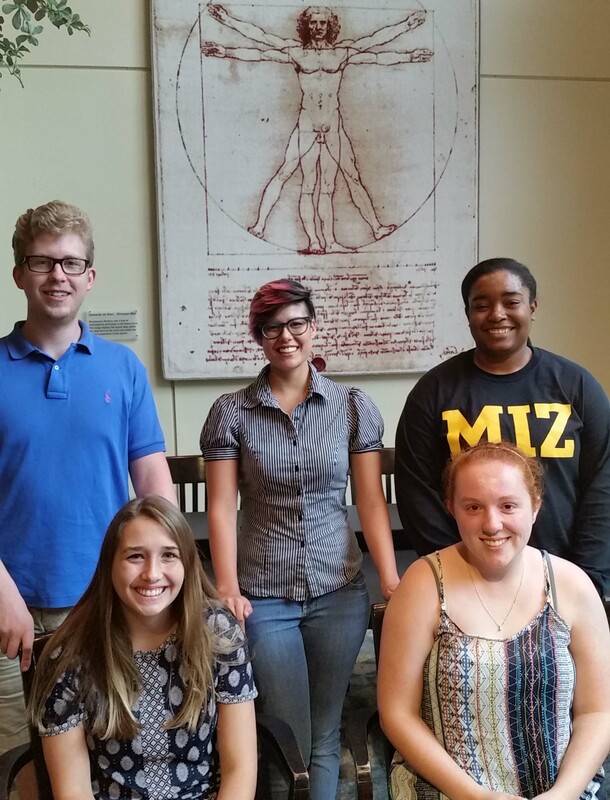 From left to right: Bekah Bowie ('16), Isaiah Addison ('16), Taylor Hall ('16), & Bailey King ('16) worked in the Pittman laboratory during the Fall 2015 semester investigating the role of central amygdala and lateral hypothalamic projections to the PBN on licking responses to tastants during long-term test sessions. Spring 2014 research team from left to right: Kelsey Smith ('14), Savanah Atkins ('16), Tyler Nelson ('16), Sarah Evans ('14), Leigh Smith ('14), Elis Sidden ('14), and Alex Brantly ('14). 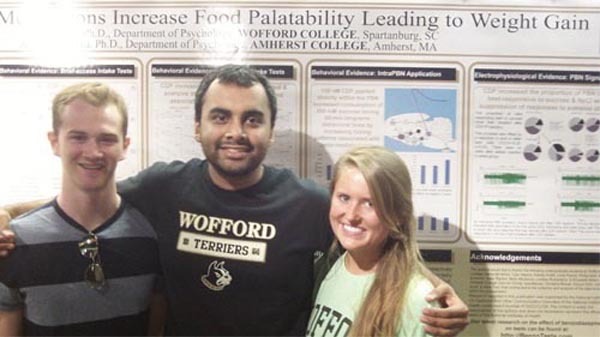 From left to right: Jayce O'Shields ('14), Deep Sangani ('14), and Savanah Atkins ('16) worked in the Pittman laboratory during the summer of 2013 investigating the effect of benzodiazepines applied directly into the PBN on licking responses to tastants during brief-access test sessions. 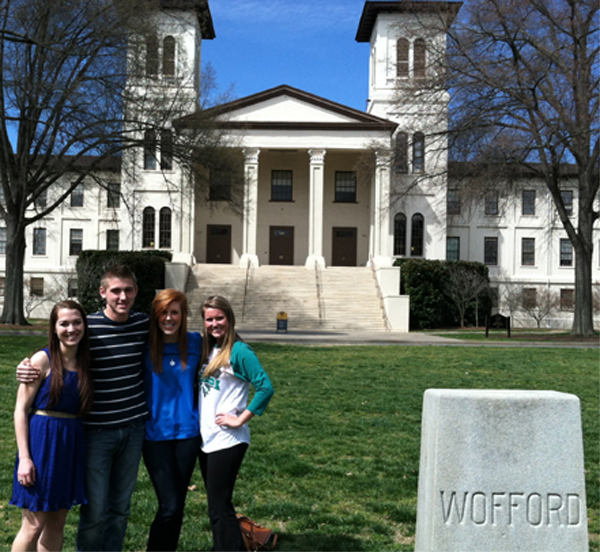 From left to right: Lindy Pence ('14), Tyler Nelson ('16), Kelsey Smith ('14), and Savanah Atkins ('16) worked in the Pittman laboratory during the Spring 2013 semester investigating the effect of benzodiazepines applied directly into the PBN on licking responses to sweet tastants during 60 minute test sessions. 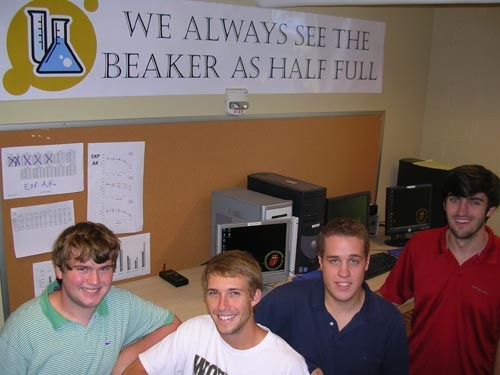 From left to right: N. Hunter Rackett ('12), Michael Schecter ('11), Phillip Neill ('11), and Isaac Rankin ('11) are investigating the effect of benzodiazepines on licking responses to a wide variety of tastants during brief access trials. 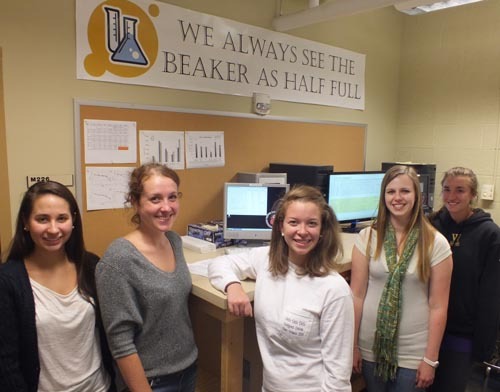 From left to right: Molly McGinnis ('09), Brittney Getz ('10), Amanda Ruscin ('09), Mazi Alimohamed ('09), Liz Miller ('09) and Lindsey Richardson ('09) are currently working in my lab investigating the effect of benzodiazepines on licking responses to a wide variety of tastants across multiple concentrations during 60 minute test sessions. Lindsey Richardson ('09) and Molly McGinnis ('09) worked in my lab as research fellows in the summer 2008 Community of Scholars program. They examined the effect of benzodiazepines on licking responses to tastants under water-deplete and water-replete conditions. They also conducted a study examining the ingestive behavior for sweet tastants during 23-hr test sessions in obesity-prone, obesity-resistant, and outbred "normal" rat strains. Kimberly Smith ('08) collected whole nerve chorda tympani responses to taste stimuli as part of her 2007-08 honors thesis project. 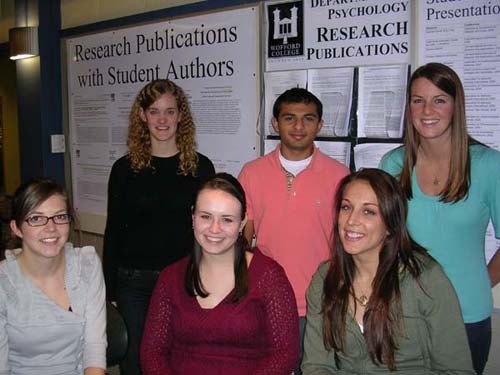 From left to right: Cameron Simmons ('09), Tia Anders ('10), David Trant ('10), Christina Jackson ('10), Covington Avent ('11), Phillip Neill ('11), and Chelsea Nill ('11) worked in the lab during the Spring 2008 semester examining the effects of a high-fat diet on the sensitivity to taste fatty acids in obesity-prone and obesity-resistant rats. 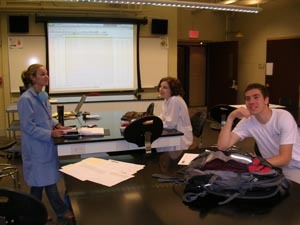 Fall 2007 - Ivy Farr ('08), Hannah Dinnen ('09), Tyler Toomes ('09) work on data analysis as part of their research project examining the effect of benzodiazepines on short-term and long-term tastant consumption patterns. 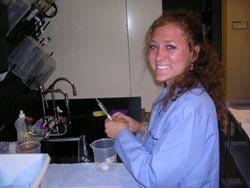 Hannah continues to work in the laboratory and Ivy is a graduate student at the College of Charleston. 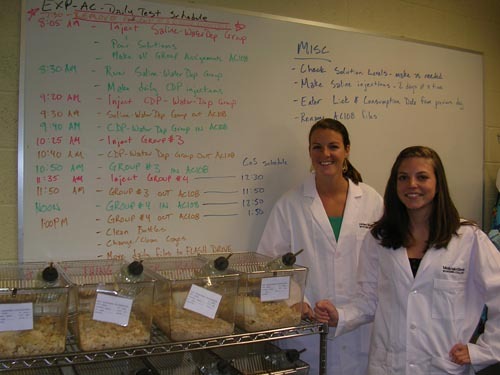 Cameron Corbin ('07), Meaghan Crawley ('07), and Kimberly Smith ('08) are research fellows in the Community of Scholars Program conducting experiments in my laboratory during the 2006 summer. 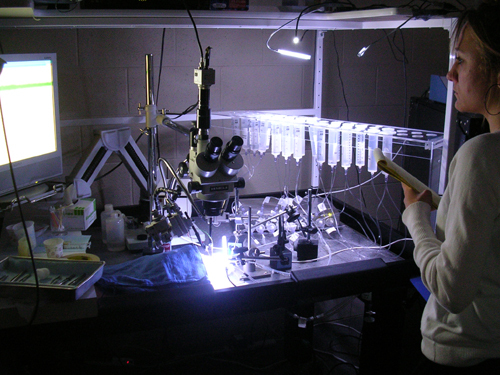 Cameron Corbin ('07) records data and operates the MS-160 Davis Rig gustatory behavioral apparatus during the summer of 2006. Cameron is currently a graduate student in the Occupational Therapy program at the Medical University of South Carolina (MUSC). 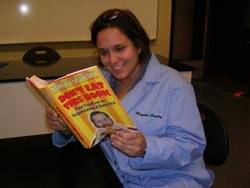 Meaghan Crawley ('07) learns about Morgan Spurlock's perspective on the health of our country in his book, Don't Eat This Book. Meaghan is currently a graduate student at Tulane University. 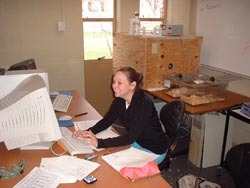 Kimberly Smith ('08) prepares unconditioned stimulus injections for the conditioned taste aversion experiment during the summer of 2006. 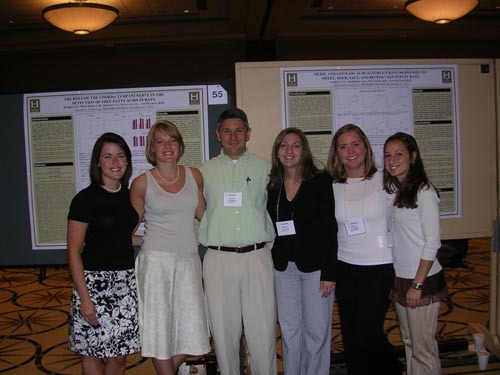 Lauren Murchison ('05), Sara Shields ('05), Dr. Pittman ('94), Abby Anderson ('05), Hayley O'Connor ('05), and Caroline Labban ('06) at the 2005 AChemS conference. 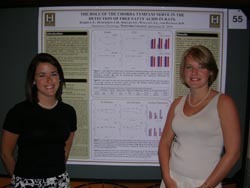 Lauren Murchison ('05) and Sara Shields ('05) present their research at the 2005 AChemS conference. After Wofford, Lauren received a master's degree in Community Counseling graduate program from Clemson and Sara completed the Physical Therapy graduate program at MUSC. 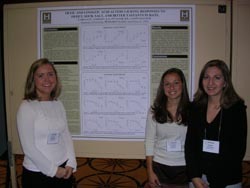 Hayley O'Connor ('05), Caroline Labban ('06), and Abby Anderson ('05) present research at the 2005 AChemS conference. Hayley O'Connor is currently pursuing a joint graduate degree in social work and divinity at Princeton & Rutgers. 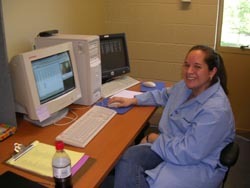 RIGHT: Jennifer Wallace ('05) collects Davis Rig data in the lab during fall 2004. 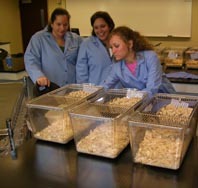 BELOW: Sara Shields ('05) and Lauren Murchison ('05) prepare animals for surgery. 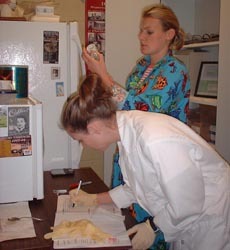 BELOW RIGHT: Jennifer Wallace ('05) and Sara Shields ('05) prepare anesthesia prior to small animal surgeries. Virgina Clyburn ('04) presents her research at the AChemS conference in 2004. Virginia is currently in medical school at the Medical University of South Carolina (MUSC). 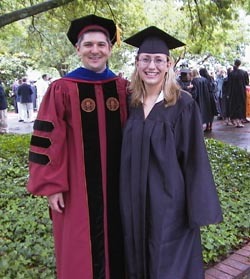 Danielle McCormack ('03) was the first graduate from my lab at Wofford. She completed her Masters in Marriage and Family Therapy at USC. 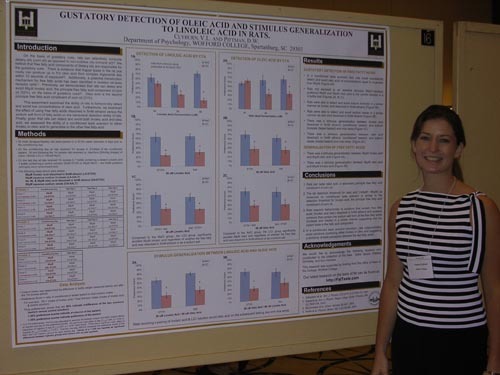 ABOVE: Danielle McCormack ('03) presents lab research at the AChemS conference in 2003. 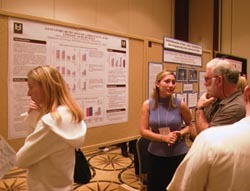 RIGHT: Petra Herzog presents research at the AChemS conference in 2003. Contact Dr. Pittman about working in his laboratory.